Sixteen Samford University students have been selected as senior honorees to lead the university’s Hanging of the Green service Dec. 4. 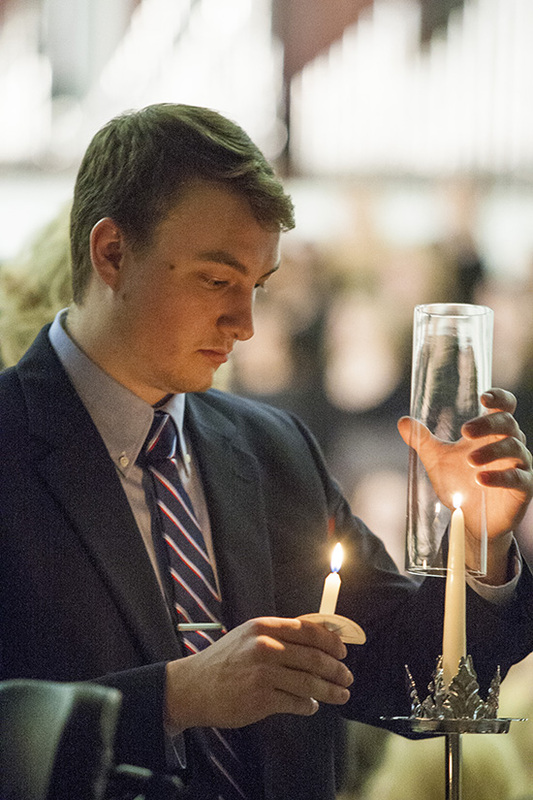 The 34th annual service is at 6 p.m. in Samford’s Reid Chapel. The service will be available via live stream at http://www.samford.edu/live/. Senior honorees are nominated by faculty and staff, and then a selection committee chooses the honorees based on leadership, scholarship, spiritual commitment and community service, according to April Robinson, the university minister who coordinates the service. Nominees had to submit a written application that included information about their Samford activities and experiences and why they wanted to be selected. Anna Bethea, music major from Shalimar, Florida. Bethea is a member of Samford Orchestra and participated in the group’s recent tour to the Dominican Republic. “This trip inspired me to always seek to use my music and my life to imitate Christ,” Bethea said. John Michael Blackmon, religion major from Carbon Hill, Alabama. He is a preministerial scholar and has been active with the Samford Sundays program. “I strive for academic excellence because I believe it is an act of worship to take the gift and opportunities [God] has given me and make the most of them,” he said. Kendall McPheeters, biology and religion major from Owens Cross Roads, Alabama. Reflecting on her Samford experience, McPheeters said, “These four years were never about me. The only way these four years would count is if I allow God to take my ordinary and turn it into something extraordinary in his grace and mercy." Amanda Moritz, psychology major from Cedar Park, Texas. A knee injury prematurely ended her Samford volleyball career. “My life was dramatically changed as I began to look at my purpose on campus with a ministry mindset and as a believer in mission,” she explained. Melanie Neff, human development and family science major from Derwood, Maryland. She is in Omicron Delta Kappa national leadership honor society. “I was very humbled to become a part of this prestigious group and to be recognized with fellow students that I deeply admire and respect,” Neff said. David Osula, biochemistry major from Jasper, Alabama. Osula has been the Samford student liaison with Habitat for Humanity for three years. “Any service that you get physically, emotionally and spiritually invested in will eventually allow you to see your service as an outpouring of God’s love,” he noted. Stenner and Yarborough will serve as narrators. The 60-member University Chorale, directed by music professor Sharon Lawhon, will provide music for the service.